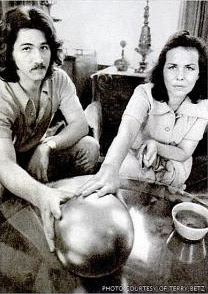 The 1970s brought us a strange and unexpected sphere that was both not publicly talked about and also never solved. The Betz Sphere is still a mystery to this day. In 1974, Terry Betz pre-med student and his parents, Gerri and Antoine, were surveying fire damage to the woods near Jacksonville. While out there, they came across an 8" diameter sphere that was highly polished metal. There were no manufacturing marks, but there was an elongated triangle carved into its surface. The sphere weighed about 22 pounds and the family didn't know what to think of it. Was it a satellite? Perhaps a cannonball of some. They set it aside and went about life. It wasn't until Terry began playing his guitar and the orb began to vibrate like a tuning fork that he realized it wasn't just a "dead" object but showed a very real reaction to the sound of his notes. When the family dog reacted to high-frequency sounds coming from it, the family decided to talk publicly with a newspaper. They watched the behavior of the sphere to find it was more active when the sun shined. Temperatures and other factors didn't seem to do a thing to it. It was a period low-frequency sound coming from it that seemed to hum that made the family wonder if the sphere was some kind of device. The sphere also moved around, showing a tendency to stop at the edge of the table and turn back, as if it were guided by some intelligence. Interestingly, just two years earlier in Japan a similar device was found by a youth who gave it chase and found it could maneuver on its own. It was referred to as the Kera UFO. Soon word got out and the orb was covered by many international news outlets as well as having a visit by the military and NASA. In the height of a public and government frenzy to understand the sphere, it began to do some very odd things. The sound of organ music could be heard throughout the house and doors started opening and closing on their own. Closer observation by experts revealed the sphere to be about a half inch thick, made of stainless steel magnetic ferrous material. It also appeared to have two round objects inside and four magnetic poles. Theories abounded but there was no consensus. Some thought it was a doomsday device sent by aliens while others thought it might be a foo fighter (the flying orbs that gave military planes chase during WWII). As truly amazing as this orb was at the time, it has been lost to history. No one knows where it went, if it's still around or what. Other orbs have fallen to earth since, but the Betz one got all the attention. Ultimately, without the sphere to examine, we will all be left to wonder if this was something extraordinary or something hyped up by the media. If someone were to come forward with the sphere today, no doubt a lot more could be discerned, given our understanding of how to study unusual objects. We can say with a fair degree of confidence that the orb was manufactured, but by whom and for what purpose? Thankfully, it did not appear to be a doomsday device, but it had an intended purpose and that may never be known. Was it a doomsday device?